The prospect of attending college can be both exciting and daunting, particularly given the current cost of tuition. Tuition costs often exceed $38,000 for a four-year degree for students attending a school in state, according to The College Board. On average, tuition costs more than twice that amount for students attending a school out of their home state. This can make higher education seem entirely out of reach for many students. While affordable online colleges are a good place to start, sometimes it's not still enough to bring college within reach. WHAT ARE THE Best COLLEGES WITH NO TUITION? Dubbed "Hard Work U," College of the Ozarks provides students with a tuition-free education in exchange for full-time weekly work on campus. To be eligible for acceptance into C of O, applicants must demonstrate financial need and verify their location of residence. Though otherwise-eligible students from outside of this service area may be considered on a case-by-case basis, applicants who reside within the Ozarks area of Arkansas, Missouri, Illinois, Oklahoma, and Kansas are shown preference. Once accepted, students must work 15 hours each week during the school year, and two 40-hour weeks when school is not in session to earn their otherwise free bachelor's degree. The college does not participate in federal aid programs in an effort to eliminate student debt. However, students may apply for Pell Grants, if deemed eligible by the FAFSA, to offset non-tuition expenses. Primarily serving the Appalachian region and the commonwealth of Kentucky, Berea College's substantial endowment allows the school to offer each student a full-tuition scholarship of nearly $100,000 for four years, as well as a laptop computer that each student can keep after graduation. Berea was the first interracial, co-ed college in the South and is among only seven remaining work colleges in the U.S. Each student participates in the college's Work Program by serving 10-15 hours per week in one of more than 100 available employment positions on and off campus. This also allows them to earn additional funds to cover room and board and other expenses incurred during the school year. Founded in 1859 by Peter Cooper, the Cooper Union for the Advancement of Science and Art has offered a full-tuition scholarship to every student since its inception, helping students to effectively earn a free bachelor's degree or graduate degree. However, as of the 2014-2015 academic year, each accepted student is awarded a half-tuition scholarship, valued at approximately $20,000, per each year of study. Merit scholarships may be awarded to students with exceptional artistic ability. Need-based federal financial aid, as well as institutional scholarships and grants, are available to eligible students to help cover the remainder of tuition costs, as well as room and board and other learning expenses. Alice Lloyd College offers a tuition-free education to applicants from 108 counties in the Central Appalachian region, including residents of Kentucky, Virginia, West Virginia, Ohio, and Tennessee. All students must participate in the college's Student Work Program as a condition of earning the financial award. A minimum of 10-20 work hours per week (or 160 hours per semester) on a job -- whether on campus or in the local community -- are required. A lasting mission of the school's founders, the school aims to strengthen students' work ethics above all else, and remains one of only seven work colleges nationwide. Applicants are strongly encouraged to return to the school's Kentucky service area to practice in their respective field of study. For students who are gifted in the musical performing arts, the Curtis Institute of Music in Philadelphia has offered merit-based, full scholarships to all students -- regardless of financial need -- since 1928, making it effectively one of the nation's tuition-free colleges. Admission is highly competitive, with a total enrollment of only 165 students. An in-person audition is required for all areas of study except vocal studies, for which a recorded submission will be accepted in lieu of an on-site performance. True to its mission to recruit students solely based on artistic merit, the Institute does not specify a minimum or maximum age to audition. Upon acceptance, all students are automatically awarded the full scholarship, though they must demonstrate financial need to receive additional assistance for living expenses through grants, loans, or work-study opportunities. Kansas' premier Christian institution is one of the country's tuition-free colleges, Barclay offers full-tuition scholarships to all students living on campus, including international students studying in the U.S. To remain eligible for the scholarship, students must fulfill Christian service requirements of at least 12 clock hours each semester for the duration of their four-year degree at Barclay. Students who live off campus are eligible for tuition scholarships covering about one-third of the total tuition cost. Additional scholarships are also available to all students seeking financial aid for expenses beyond tuition costs. Webb is the oldest school to exclusively offer naval architecture and marine engineering programs in the U.S. Upon acceptance into the college, Webb students receive a full-tuition scholarship and are responsible only for supplemental costs, such as room and board, books, and additional learning and living expenses, making for a largely free college experience. A one-time laptop fee is required during the first year and can be paid in two installments. Those seeking federal aid to help cover these additional costs are required to complete the FAFSA to determine eligibility for the Pell Grant, NY State TAP, or Federal Direct Loan Program. Institutional and federal scholarships are also available to help students truly earn a free bachelor's degree. Graduates of Webb Institute also enjoy success in the job market with a 100% job placement rate. One of five United States Military Academies, the Merchant Marine Academy prepares students for careers in the maritime industry and within the armed forces. The Marine Academy is unique among U.S. military schools for its flexible post-graduation service options. While other Academies require graduates to enlist in a branch of the U.S. armed forces, Merchant Marine Academy graduates can fulfill their service obligation through private employment in the maritime or transportation industry, if they so choose. As one of a few tuition-free colleges, this school does not charge students for classes, but students are responsible for other expenses, such as a laptop computer for classwork. However, they may apply for need-based financial aid to help cover these non-tuition expenses. A dedicated military academy focused on preparing its students to serve as officers in the Air Force, USAFA upholds highly competitive admissions requirements. Applicants must be nominated for admission by a member of Congress or the Vice President of the United States, though limited nominations will also be accepted in military-affiliated, U.S. territory, and international categories. Upon acceptance into the Academy, students receive a scholarship valued at over $400,000, which covers tuition and room and board costs for all four years of their training experience. To further earn this free college tuition, cadets are expected to complete a service commitment of several years on active duty and in the reserves after graduation. Applicants to Macaulay Honors College at CUNY who meet CUNY's New York state residency requirements will receive a full scholarship, which covers all tuition costs upon acceptance to the school. In addition to this free college tuition coverage, CUNY students may apply for benefits, including the Macaulay Opportunities Fund, which offers a standalone grant of up to $7,500 to be used toward supplemental learning experiences, such as a study abroad, internship, or professional development project. It may also be applied to the Cultural Passport, which offers student discounts to area cultural attractions, including museums and arts events. In addition, freshmen receive a free laptop computer during their orientation course. What Does it Mean When a College Offers Tuition-Free Programs? Tuition-free colleges are ideal for low-income students and professionals who want to expand their employment opportunities without accruing debt. Some schools offer full-tuition waivers to qualifying degree seekers. Often, schools only waive tuition for students from particular geographic regions or economic backgrounds. Some institutions waive tuition for professionals working in a particular field. However, students who receive tuition waivers typically pay with their time. Most colleges that offer free tuition require students to fulfill work or service commitments. Some accredited tuition-free colleges assist students who agree to participate in community service or pursue a particular career path. Many working professionals choose tuition-free online colleges. Do I Need to Pay Any Fees if I Attend a College with Free Tuition? Earning a free online college degree presents many benefits, but that education does not necessarily come without a cost. Institutions that offer free college tuition still need funds to maintain academic excellence. One way to gain this financial assistance involves charging certain fees. As an example, the quality of science departments could diminish without the proper equipment and facilities. A lab fee for science courses can help the school gather supplies for coursework and replace any outdated materials. Students pursuing a free online college degree should still consider how to pay any associated fees. Degree candidates may fund their education through loans, scholarships, and grants. Grants and scholarships require no repayment, but students must repay all loans after leaving school. Students may also receive fee waivers that excuse them from specified fees. Different schools require students to pay different fees. While some tuition-free online colleges charge a technology fee, other schools do not include that expense. Some fees cover one-time expenses, while others renew each term. Fee pricing also varies from one institution to another. Applicants should contact their school to receive a current fee schedule and plan accordingly. Many schools require new students, particularly freshmen, to participate in orientation. An attendance fee helps schools pay for event expenses, including food. Prices vary by institution. Students may pay as little as $25 to well over $100 for this expense. Some colleges charge as much as $450. Colleges and universities receive applications from thousands of students every year. The application fee provides compensation for time spent reviewing application materials. These fees typically cost less than $100. Many schools waive the application fee for certain students. Students who live on campus must pay housing expenses, which may include a meal plan. These costs vary from $1,000 to over $10,000. College textbooks can present a major college expense, since each book can cost over $100. Additionally, some courses may require more than one text. To save money, degree candidates can choose to buy used textbooks or trade with their peers. Schools collect these fees to assist with campus upkeep. Particularly for tuition-free schools, this money can prevent colleges and universities from falling into disrepair. Fee amounts vary drastically by institution. These fees cover graduation-related expenses such as the facility cost, faculty pay, and graduation robes. Students pursuing free online college degrees often pay less than $100, but amounts can vary based on degree level. Schools use lab fees to pay for supplies, particularly in science, computer, and nursing courses. Lab fees can require a small payment, such as $4, or can cost up to $800. Students may need to pay for tests such as the College Level Examination Program (CLEP) or the Test for Essential Academic Skills. Related fees can run as low as $10 or as high as $100. Tuition-free colleges often charge students fees to cover the technological expenses associated with a free online college degree. Schools may calculate these fees by term or by course. Charges by semester may range from $100-$300. Per-course rates may cost less than $20, depending on the school. This fee finances student transportation such as buses or transit passes. Schools often charge less than $10 for this expense, but can require as much as $40. Are Colleges With Free Tuition Programs Accredited? Tuition-free online colleges can be a great value, but students researching free-college options should consider each school's accreditation status. Employers tend to seek out candidates with credentials from accredited institutions. Enrolling in an accredited tuition-free college ensures that students can pursue further education. Credits transfer easily between accredited schools, and graduate programs typically require applicants to hold an undergraduate degree from an accredited institution. National and regional accreditation are the two most common types, and of the two, regional accreditation is more highly regarded. 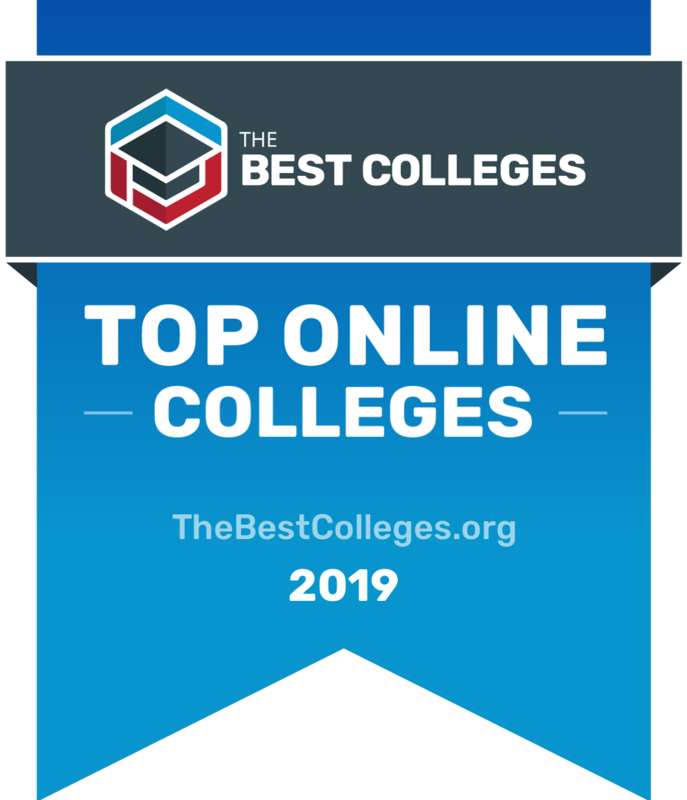 BestColleges.com only ranks accredited programs, so each tuition-free college listed on this page meets established standards for academic quality and rigor. For information regarding recognized accrediting agencies, visit the U.S. Department of Education and the Council for Higher Education Accreditation websites. Students may decide that free tuition presents a sensible option for learning, or they might conclude that paying tuition costs strengthens the value of education. Evidence exists to support both sides of this argument. A college education can open professional doors and increase lifetime income. According to the Social Security Administration, college graduates may earn $1,000,000 more during their lifetimes than high school graduates. This data may lead citizens to answer, "no," to the question: Should college be free? In this argument, college is an investment that gradually pays for itself. Furthermore, without tuition, schools may not receive enough funding to maintain their departments. Opponents of free college often question if taxpayers would make up this difference. Additionally, certain critics claim that free college might lead to lower academic performance. Currently, students receiving financial aid must maintain a certain GPA and must not fail any courses. If all classes are free, students may have less of an incentive to perform highly. However, the high cost of college makes education inaccessible to many students. This creates a feedback loop where low-income students cannot go to school, and thus perpetually stay in low-income jobs. The controversy over student loan debt adds momentum to this side of the debate. Current and former students owe over $1 trillion in U.S. student loans. Steep repayment plans may prevent students from investing in a house, car, or children. Many people view this factor as evidence that student loans have a detrimental effect on the economy. Free college tuition also leads to a more well-educated and skilled workforce, giving the U.S. a competitive advantage over other countries. Free college experiences would allow learners to achieve higher salaries and professional positions without the burdens associated with loan debt. Although students in a free online college degree program do not pay tuition, they still must cover the cost of housing, fees, and other expenses. Student loans can provide an easy method of paying for college education, but students should consider other options before resorting to this form of financial assistance. These loans often come with high interest rates. For undergraduate direct subsidized and unsubsidized loans, the interest rate is 5.05%. Similar graduate loans charge 6.6% interest and PLUS loans charge a 7.6% interest rate. These numbers vary year by year based on the state of the economy. Private loans charge even higher interest rates. Failing to repay student loans can lead to ruined credit and garnished wages. Unlike other forms of debt, bankruptcy does not automatically clear student loans. With these factors in mind, any loan received can damage students' financial futures. To avoid student loans, degree candidates can work through school or enroll in a university payment plan. Students may also use grants, scholarships, and work-study options. Working students should check with their employers about tuition reimbursement. Students can also enroll in credit-heavy semesters to shorten the number of semesters needed to finish program requirements. Do Ivy League Schools Offer Free Tuition? Acceptance to an Ivy League college demonstrates a student's scholastic excellence. However, Ivy League universities usually do not offer financial aid based on academic merit, athletic performance, or artistic talent. Fortunately middle- and low-income students may qualify for need-based aid to cover expenses. All eight Ivy League institutions offer tuition waivers to students with low annual family incomes. As with most other tuition-free colleges, these waivers do not cover costs related to living or non-tuition expenses. In addition to free college tuition, low-income students may be eligible for a full-ride scholarship that covers room and board. Although requirements vary by school, students who qualify for an Ivy League full-ride scholarship typically have an annual family income below $65,000. Do Military Schools Offer Free Tuition? Certain military academies offer free college tuition to qualified applicants who meet admission standards. Admission requirements for these schools prove so unique that the institutions do not fit among this article's rankings. For instance, students may need to pass a medical exam, have no children, or earn an admission nomination from a U.S. senator, a U.S. representative, or the U.S. vice president. Additionally, these schools may require students to commit to service in a specific military branch following graduation. When considering how to go to college for free, military service provides a suitable option for many candidates. Military academies may pay for room, board, and tuition, and may also provide students with salaries. Military academies of this nature include the U.S. Coast Guard Academy, U.S. Military Academy West Point, and U.S. Naval Academy. To determine the best colleges with free tuition, we looked at the most important factors prospective students, mainly common predictors of future success and a school's commitment to online programs. This boils down to admissions rate, student loan default rate, retention rate, graduation rate, and the percent of students enrolled in online classes. All data points are taken from information provided by colleges and universities to the National Center for Education Statistics. Each factor is weighted evenly in order to give an objective view and determine the top 10 colleges with free tuition. To calculate our rankings, we looked at a school's ranking when organized by a single factor, and then averaged each category's ranking to find an overall score: Admissions Rate (20%) + Default Rate (20%) + Retention Rate (20%) + Graduation Rate (20%) + Percent of Students Enrolled in Online Classes (20%) = Final score.